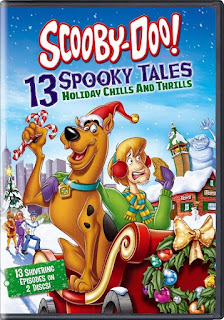 This DVD compilation includes Christmas or winter themed episodes from across the dozen or so incarnations of Scooby Doo over the years. Unfortunately, the majority are less Christmas than winter, and we already reviewed one episode, A Scooby-Doo Christmas, a few years ago. 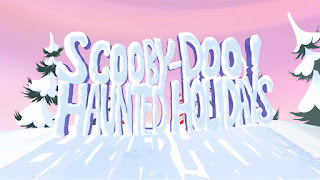 We're going to review the other two Christmas centered episodes, Haunted Holidays and The Nutcracker Scoob, on their own. That leaves ten of dubious holiday connection. 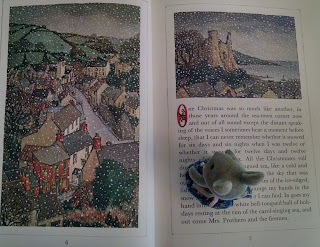 We almost didn't write these up at all, but a few included some holiday allusions or references, plus the snowy visuals were certainly evocative of Christmas. Ultimately, we decided to cover them together, along with some discussion of how each ties to the holidays, if at all. 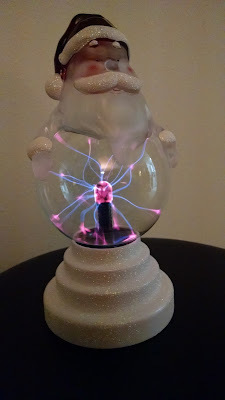 Before you ask, the answer is yes - that is a plasma ball built into Santa's stomach. 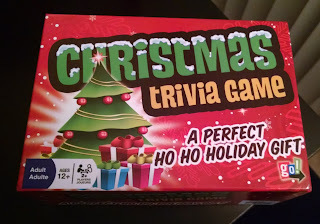 We found this in early November at Fred Meyer on sale for 50% of its suggested retail price. If I even have to explain why we bought it, you're reading the wrong blog. The tag on this calls it an "LED Touch Globe With Icon". The "Icon" part is to keep things ambiguous, since they also had ones with a snowman motif. Between the two, I can't imagine anyone picking up the snowman. 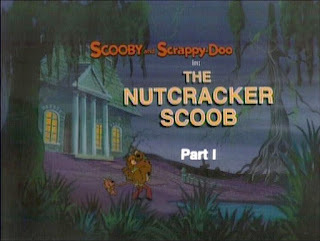 The Nutcracker Scoob is notable for being the final episode of The New Scooby-Doo Mysteries, which is primarily significant for being the last time the character of Scrappy-Doo was inflicted on audiences as a series regular. As such, it was a tad anti-climatic. At the very least, they could have re-enacted the resolution of Old Yeller than turned on the laugh track. Now that would had gotten some ratings. Instead, they told a relatively straight-forward Scooby-Doo tale centered around a Christmas pageant at a children's home. Of course, the place is in danger even before the faux ghost shows up: a cruel, oddly Victorian businessman named Winslow Nickelby is trying to force them to sell him the building on Christmas Eve. It would be easier to feel for the owners if there was some indication the home contained anything other than a theater. 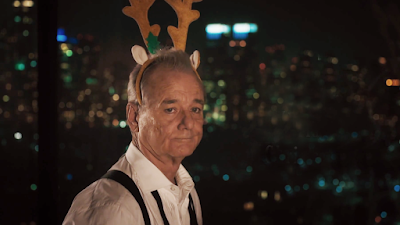 On the page for their new Christmas special, Netflix tags A Very Murray Christmas as "Witty, Quirky, Irreverent, Deadpan." This is probably as good a description as any I'm going to offer, but the internet isn't going to fill itself up with inane blather. If I weren't copying off of Netflix's test answers, the other way I'd describe it would be a traditional Christmas special from a post-modern perspective. It's almost a deconstruction of the classic formula that doesn't actually want to give up that formula. Sound weird? It is. I'm sorry. Not weird - quirky. I have seen this book on lists of classic Christmas stories for years now, but it just kept falling to the bottom of the to-read list. It probably could have stayed there. There's nothing wrong with it. It's a short story's worth of words poetically describing the activities and feelings of the holiday at a very particular place and time. It's pretty, especially the version I had with big color illustrations. But there's just not much to it other than nostalgia and pretty phrases. There are some very pretty phrases, admittedly. There's food, and weather, and an amusing story about a fire scare fought with snowballs, and a brief interlude where young boys sing carols outside a creepy house. Whether the narrator is speaking to a general audience or one person was unclear; it seemed to shift without clear demarcation of any sort. I can't even remember for sure where we caught the trailer for this thing. It was some DVD or another. At any rate, we saw this starred Harry Connick, Jr., Kris Kristofferson, and Willie Nelson, and were morbidly curious what that combination would yield in a low-budget family-friendly Christmas dramedy. 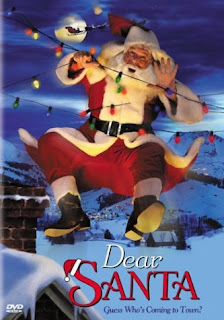 The plot centers around Connick's character, a middle-aged college professor with a vendetta against the holidays. Turns out, when he was a kid, his brother died after saving his life on a lake they were skating on with their new Christmas skates. The flashback scene depicting this, incidentally, was hilarious. 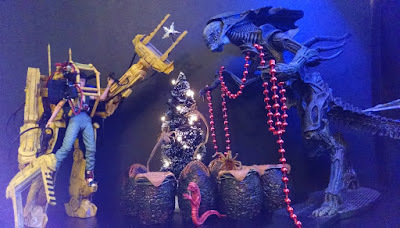 At any rate, he's a father now, and his son, who's about the same age he was when he lost his brother, loves Christmas. He wants to spend the holiday with his grandparents, presumably because his grandfather used to hunt vampires with Blade, but his dad's too horrified with the whole thing. 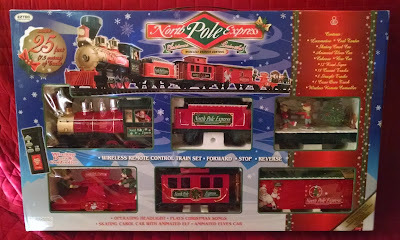 There are numerous holiday train sets on the market. This is one of the absolute cheapest, retailing for $65. If you can't find it on sale for half the retail price or less, don't waste your money. I may have gotten a slightly better deal than that. Was in a Toys R Us last January buying some clearanced stuff, including a cheap Christmas game comically marked down to $0.03 in their system. When I got the front of the store, this train set was behind the register. Someone had returned it, and they'd yet to move it back to the floor. Since all their holiday stuff was marked way down, the associate ringing me up asked if I'd be curious what the train set was going for. Of course I was, so he scanned it: $0.03. I love automated discount systems. Like tinsel on a freshly decorated Christmas tree. God, I love this time of year. This picture, like those Nerdtivities we did last year, hasn't been adjusted beyond a little cropping. All props were present, and a blacklight was used to create the effect. Of course, I had to take about a hundred different versions to get the one I wanted. Which actually has a few advantages - here's a little bonus Google generated automatically. "Look, Ma! 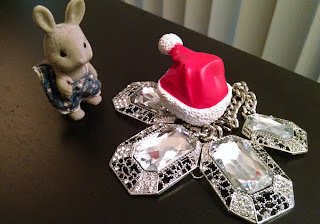 I found an ornament!" Happy holidays, from your friends at Mainlining Christmas. Yup, this might be another year for versions of the Nutcracker. This one is now our favorite. If you’re going to watch a film of a ballet, skip this boring one, and this better, but still dull one and probably even this one in favor of The Hard Nut. This production does suffer from the same problem that plagues almost all attempts to film a live performance: the person choosing the shot sometimes chooses the most boring part of the stage, or hides a transition that would actually be interesting to watch, or focuses on one character when something interesting is happening across the stage as a whole. This film version was produced for PBS in 1991, and the intro pieces with choreographer Mark Morris are clearly a bit dated. That said, the design, story and energy of this version lifts it well above others we’ve seen. I am unprepared for this review. It's not easy for me to admit as a writer, but I'm just not ready for this: my language skills aren't up to the task. So I'm going to need you to give me a moment. I just have to duck out of this tab, go over to Thesaurus.com, and look up as many synonyms as I can find for the word "stupid." Alright. I think we're ready to get started. The opening credits are in a font that's supposed to mimic a child's handwriting, but the bright green color makes them nearly indistinguishable from comic sans. At this point, we thought we had a pretty good idea what kind of movie we were sitting down to watch, but we were wrong: this montage was, inexplicably, the most thoughtful section of the film. Everything that came after was significantly more idiotic. For a dark avenger, there are a surprising number of famous Batman Christmas stories, including well regarded episodes from severalanimatedseries, a holiday movie, and even a video game. There have been quite a few Christmas comic issues, as well, over the years, but you wouldn't expect anything else from a character who's been around for seventy-five years with multiple titles a large portion of that time. 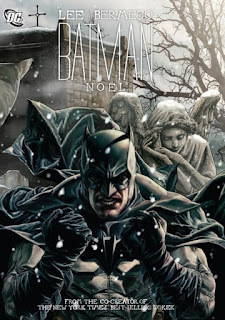 One of the more iconic Batman holiday stories in his original medium is Batman: Noel, a graphic novel from 2011 that attempts to adapt A Christmas Carol using the Dark Knight as a stand-in for Scrooge and supporting characters in other roles. That, that was a thing that we sat through. Erin swears that he doesn’t remember why it was on our Netflix DVD queue. After watching it, we agreed that evidence suggests it was on some ‘worst holiday movies’ list. I thought it wasn’t going to be much from the opening credits, frankly, but the acting in this movie ended up being truly remarkable. The acting, the writing, the special effects and the production values: all of these were at a level that is hard to describe. I’ll try, though. Picture a bunch of fifth graders who have been brought up in a room with no contact with the outside world. They only learned about how people behave from two sources: only the most cliche and flat television from the 40’s and 50’s, and from one adult who has kind of a sadistic vibe. These kids write, direct, design and act in a holiday play. This is that play. 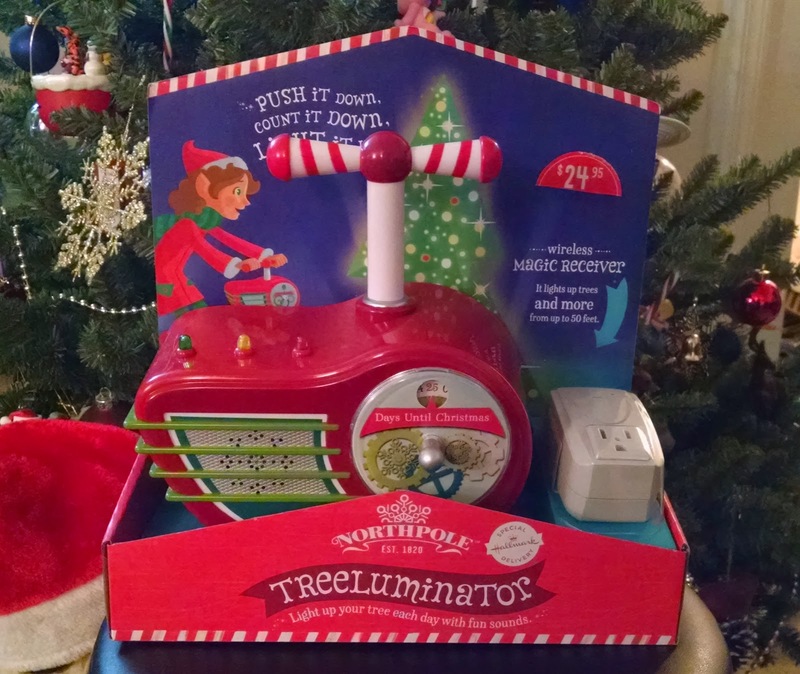 The Treeluminator is part of Hallmark's Northpole line, which ties into a made-for-TV movie they released last year, which we need to track down at some point. The movie looks awful, but - so far - I'm actually kind of liking most of the merchandise. This is a neat, albeit simple, concept. Essentially, the Treeluminator is a wireless on/off switch toggled by a battery-operated detonator. When you press down on the plunger, the red box plays one of five short sound effects, the three LED lights on top flash, then whatever's plugged in on the other end - presumably Christmas lights - activates. Press the plunger again to turn off the power. Oh, right. That era when Disney tried capitalizing on every movie they'd ever made by producing an endless sea of direct-to-video sequels and spin-off TV series: I remember that. The original Lilo and Stitch movie is pretty great, though it's always seemed derivative of The Iron Giant to me. Not this episode though: it feels derivative of Dora the Explorer. The premise of the series, according to the internet, seems to involve Lilo and Stitch trying to locate a bunch of experiments, like Stitch. Apparently, this was connected to the direct-to-video sequel no one saw. I guess that sort of fits what I just watched. Sort of. The episode opens with Lilo explaining Christmas to Stitch. The results are less humorous than depressing. Also, it seems like like Jumba and Pleakley are living with them, for some reason. Also relevant is Gantu, who has an experiment pellet wrapped as a gift. Again, I'm not entirely clear on why he did this. Fortunately, I don't care in the least. Haunted Holidays is a special that was produced direct-to-DVD for this compilation, and I rather liked it. Or at least it wasn't awful. The premise is more than a bit sketchy: Fred, Daphne and Velma are helping with a Christmas parade for a big toy store, for some reason, when it’s attacked by a crazed evil snowman. The thing has freezing breath and shapeshifting; it’s actually almost scary when it turns into a snow-spider-beast or a snow-alien-mouth-tentacle-thing. 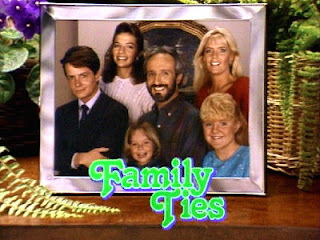 In 1985, I was six years old, Family Ties was my favorite show on television, mostly because of Michael J. Fox's Alex Keaton. Re-watching a few episodes three decades later, I can't really tell why I liked the show all that much, though Fox's deliveries seem to be the highlight. The show's premise revolved around a couple of liberal ex-hippies raising kids who were more in tune with 80's materialism and conservative politics. As a meditation on the power of the instinct to rebel, even when that means rebelling against the very concept of rebellion, I'd expect them to have enough material to fill two or three hours. 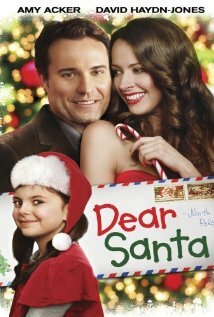 The fact this show lasted seven seasons (including the three holiday episodes below) plus a made-for-TV movie doesn't bode well for its watchability. 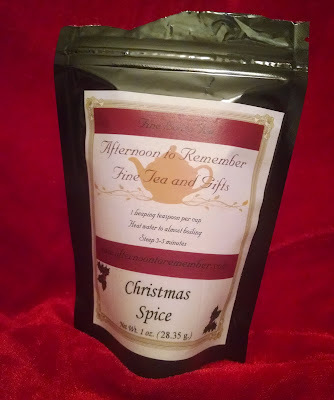 We picked up this special tea blend at 'An Afternoon to Remember', a cute tea shop in Bothell, WA. It smells just like Christmas. It's a loose tea, so you need an infuser of some kind. The mix smells amazing even before you steep it, it's full of spices. When you make the tea, it smells, as I said, like Christmas. You can tease out apple, vanilla, cinnamon, and cloves. It tastes lovely as well, of tea and spice and just enough of a hint of fruit. Happily, although this is a local shop, the magic of the internet means that you can buy your own amazing Christmas tea. Enjoy! New Release! I received an electronic copy of this book from NetGalley for the purpose of review. Premise: Another collection of Christmas Mystery stories, this one from the British Library Crime Classics series. Fifteen tales of murder and thievery at the holidays. I know, you'd think I would be sick of short mysteries after last year's lengthy read of the Big Book of Christmas Mysteries. However, in this book I discovered a well-balanced selection that was enjoyable overall . I think I may be giving extra credit for being of a manageable length, though. A classic, I would never fault anyone for adding this to a Christmas compilation. It remains charming on whatever number re-read this is.